It was during the public media debate on this topic in the 1960s that Hong’s ideas gained support and popularity in China. Many famous taiji practitioners corresponded with him and came to Jinan to consult with him on this topic. 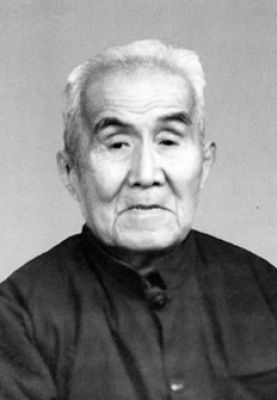 He was credited by famous taiji master and historian Gu Liuxin (He was chairman of the Shanghai Martial Arts Association) as the leading authority after Chen Xin (16th generation master of the Chen Family) on the subject of peng. For his students, peng was SOMETHING that can be felt and experienced but cannot be immediately reproduced and copied. It was that SOMETHING that was unique about Hong’s Chen Style taijiquan. It was that special ability that he possessed. It was that something that cannot be pin-pointed. 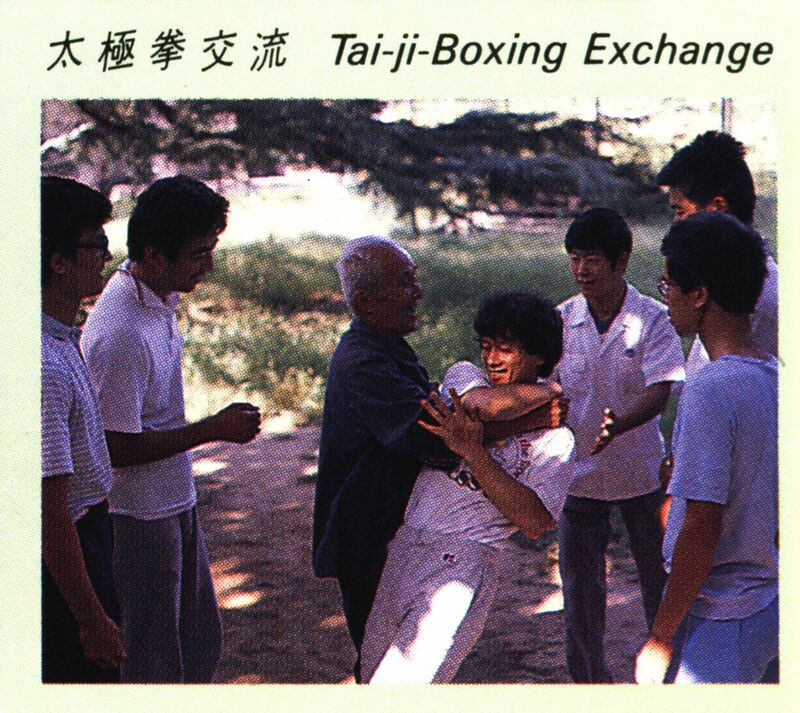 It was the true meaning of taijiquan. It was the secret of taijiquan. Gong (foundation training) and Fa (technique training) have been historically separated as two components in the learning process. Quite often this is shown in the case that a master will teach all the choreographed forms without explaining the meaning of the forms. Obviously the form looks fancy but the the real fighting ability comes from the Gong. It is a sad fact that many students often try to beat the teacher as the first step in establishing a reputation. In such a case, the teacher deliberately avoided the teaching of substance (gong) to the students at the beginning. In many cases, this “testing period” can last a long time. Ultimately this approach caused the divorce of gong and fa. Eventually, gong and fa become unrecognizable to the students. The students will not be able to use the form simply by learning and practicing it. They need to have the gong of the form privately shown to them by the master. The old saying, “Rather teach 10 fa than 1 gong.” shows how well-guarded gong was in the past. It was no exception with the Chen Family. Hong’s system amalgamated gong and fa. This means that the form that is learned can be directly applied in push hands or real fighting situations. Students no longer need to practice Gong for dozens of years in order to extrapolate the fa from these gongs. This also means that his forms (First Set and Cannon Fist) are taught in a very precise way. There is no room for mistakes or personal opinion on it. Movements and angles are measured by the millimeter. Hong himself was reported to have done his forms without any change for over 50 years! In today’s Taijiquan scene of virtually no standardization (everyone is doing a form of their own and therefore there is no point of reference for anyone! ), this is a positive step and point of hope for new students of the art. Master Hong believed that Taijiquan is a traditional Chinese martial arts with a rich accumulated repertoire of knowledge. However, there is nothing supernatural about it. He advocated that “superior and super-natural like” skills can be developed through precise movements based on the rules of taiji, which in turn adhere to laws of physics. Master Hong always relied on facts and personal experiences for his understanding. He taught not to accept anything without verification. He cautioned students that the world of martial arts, though with all the wonderfully rich legacy, was also infested with myths, exaggerations and even lies. He believed that learning occurs when there is a system. He took Yi Lu (first routine) and Cannon Fist (second routine) apart and categorized the moves according to applications and principles involved. For example, the cloud hand category included the three cloud hands, front trick and back trick, wild horse parts its mane, grand red fist and small red fist in the second routine, and yellow dragon stirs water three times in second routine. Hong Junsheng was one of Chen Fake’s earliest disciples. He studied from Chen Fake for 15 years from 1930 till 1944. Many of Chen’s students were famous martial artists (such as Li Jianhua, Xu Rusheng, and Gu Liuxin) who came to improve their already very high skills. Hong came to improve his health. As a result, his approach to learning was not the same as that of the other students. His main study method was, watching, observing and listening to instructions. He was mainly concerned with whether what he did conformed to taiji principles that he was taught. He was less concerned with whether they worked. He was always open to admit that he was the least accomplished of Chen Fake’s students. That was modesty on his part. The fact that he was the only person who followed Chen Fake for 15 uninterrupted years made him an expert on the art of Chen Fake. Many of Chen Fake’s students asked him for advice and information on Chen Fake. Hong believed that the concept of power is an important distinguishing feature of systems. External systems develop physical power from the outside. Internal systems develop power from within . Further, the way power is generated distinguishes subsystems too. Taiji, Xingyi and Bagua are subsystems of internal system. According to him, Xingyi genuinely aims to generate internal power. So does Bagua. It is not the case with Taiji. In Taiji, there is no real power generated. Instead, it is a “perceived power” that Taiji is concerned with. One of the problems for learners of taijiquan is the confusion in the forms. This can take the shape of differences among different masters teaching the same form. This can also take the form of the same master changing form over time. As is known, Chen Fake introduced a newer choreography of his form later on in his life that was drastically different from what he taught earlier in his life. Hong spent 15 (1930-1944) years learning from Chen Fake. As he was learning for health, he did not put too much of his own thoughts into what he was learning. He learned, practiced and occasionally asked for explanations. His education from Chen Fake was based on the earlier forms, not the new form that Chen Fake taught later on. 15 years of training with Chen Fake at a time before Chen started making changes to his form, made very strong impressions on Hong’s body. 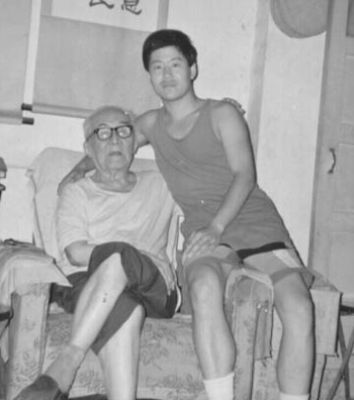 After 11 years of practicing this form on his own in Jinan after he left Beijing, he went only once to have his form corrected by Chen Fake in 1956. After 1956, he went back to Jinan and taught the revised form till he passed away in 1996. His choreography (form) was so well drilled into him that for the rest of his life, it looked the same without any changes. In 1991 a Japanese student commented that his personal video tapes of Hong from 1983 to 1991 did not show one bit of change in his form, not even one angle change. As Hong always taught in the same location, the same foot would land on the same brick at the same place in the form. Because of the marriage of gong and fa, the Hong system has no more distinction between form practice and push hands practice. The two are not sequential any more. Instead, the preference of one over the other becomes a personal choice according to one’s ability and temperament. For Hong, the power of taiji is in Peng and Peng is achieved through spiral turning . In turn, true spirals are achieved by having synchronized “Self turning” and “Global Turning”. “Self Turning” is analogous to the self turning of the earth on its own axis, producing day and night in one cycle. “Self Turning” in taiji separates yin and yang. “Global Turning” is analogous to the traveling of the earth around the sun, producing 12 months in one cycle. “Global Turning” in taiji produces the 13 energies (12 plus central equilibrium). Hong was taught that the eyes mainly follow the movement of the hand and the movement of the body. Through his years of practice, he came to the realization that this method made the practitioner’s body toss (not turning on an axis). He changed this to the eyes fixed on the opponent. This makes the body more upright and balanced. More turning and torque energy is produced. This is one of Hong’s preoccupations. He believed that the true peng energy of the Chen Style is in the spiral movements. The correct way to move spirally is to move precisely 45 degrees horizontally and vertically at the same time. Hong believed that the separation of the upper and lower bodies is crucial to the solution to double-weight (or double-heavy). Double-weight is manifested in being caught stiff (losing balance). When upper and lower body separation is applied, the balance is maintained. o The Body is Centered. The body must be centered and can only turn like a wheel, or a door-hinge. When engagement is required to close the person-to-person distance, stepping is used while still maintaining body center. Overall, in both form practice and in push-hands, the spine can not sway sideways, it can only turn to the side for a maximum of 45 degrees. It does not make a 180 degree turn. His system is proven to elevate students from beginners to advance learners of Chen Style Taijiquan in a short time. It works because it was tested through trial and error. It was tested based on the sound taijiquan principles listed above. Yet, you are here registered to Chen Zhonghua’s website. In any case, shouldn’t this comment be directed to the person who referred you?